The first Kulula aircraft took to Southern African skies in August 2001, when Kulula.com was born. Back then, there were only three flights between Johannesburg and Cape Town, and only four percent of South Africans travelled by air each year. Kulula soon changed this by becoming South Africa's first low-cost airline, making domestic air travel far more affordable. 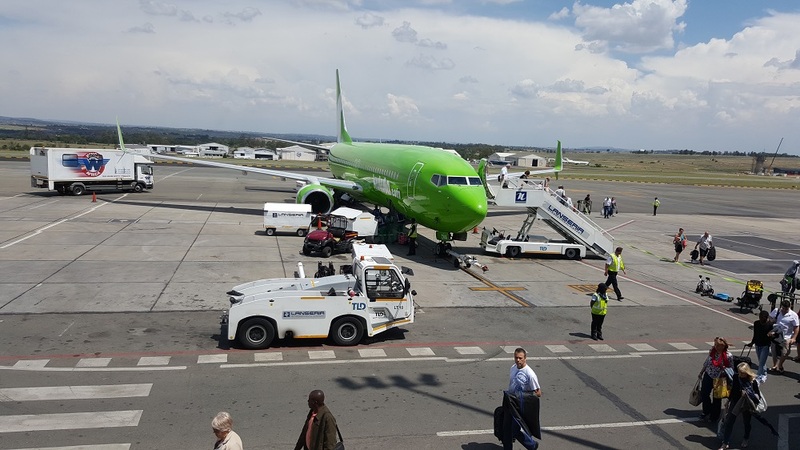 Today, there are on average 16 flights a day between Johannesburg OR Tambo and Cape Town International everyday (and even more if Lanseria airport flights are included) and Kulula now flies from CPT to OR Tambo, King Shaka International and Lanseria International. Kulula is famous for it’s funky corporate identity, their adverts often topics of conversation (just earlier this year, FIFA ordered them to remove their advertisement where they claimed to be the “Unofficial National Carrier of the You-Know-What.” They have stayed far away from the conventional airline image by staying true to their name, Kulula, which is Zulu for “It is simple”. Kulula Connect: simple and low cost communications products, including cell phones and internet. There is even an option to order flowers through Netflorist! Green is not just a corporate colour for Kulula, they have really gone green by partnering up with Food and Trees for Africa to address their carbon footprint. When you book your tickets with Kulula, you have the option to contribute from R10 to R200 towards Project Green, which goes towards greening rural communities and schools in South Africa. They have also upgraded their fleet recently, from Boeing MD-82s to the more fuel-efficient Boeing 737-800s. Booking a ticket with Kulula is easy, just go to their website (www.kulula.com), choose your dates, and their system will show you available flights, with all the details. Then you select the flights you want, enter the passenger details, and pay with your credit card, eBucks, EFT, SID or direct deposit. You can also get flight discounts if you are a member of one of their partners (such as Discovery Health). Alternatively, you can book by calling their call centre, where a consultant can make the booking for you. A flight from Jo’burg to Cape Town typically takes two hours and ten minutes, with the return flight taking just two hours. During the flight, Kulula does not serve an inclusive meal, as traditional airlines do. Instead, they offer a selection of snacks from Woolworths, you just have to remember to take some cash with you. As entertainment, their in-flight magazine “Khuluma” should distract you for most of the flight, otherwise there is also a downloadable podcast from the website which you can load onto your iPod, MP3 player or even just your laptop. It is free, you just have to remember to do this before you leave. Each passenger is allowed one hand baggage up to 7kg, and checked-in baggage up to 20kg. If you plan to have excess baggage, you can pay for it online or via the call centre before your flight, and get a discount. Infants are only charged R50 to travel with an adult, and get a free check-in baggage up to 10kg free, as well as a pushchair and a child car seat. Formerly known as the Jan Smuts International Airport, and then the Johannesburg International Airport, OR Tambo is now South Africa’s busiest airport, handling 19.5 million passengers in 2007. It has undergone a major development in preparation for the FIFA World Cup earlier this year, and is now a true world class airport, boasting one of only three stops of the new Gautrain, a first in South Africa. If you live in Johannesburg, you’ve probably ridden it with friends just to have breakfast at the airport! Lanseria airport started 30 years ago as a dusty airfield a little outside of Jo’burg. With sprawling Jo’burg building housing estates all around, it has just about reached Lanseria so that Lanseria can no longer be considered as “outside” of Jo’burg, and it has also turned into a thriving international airport in its own right. Many prefer Lanseria to OR Tambo because there is less traffic, and it is also conveniently situated to the west of Jo’burg, whereas OR Tambo is to the east. Similar to OR Tambo, the Cape Town airport has undergone major renovations, and has increased its size considerably to handle the additional traffic for the FIFA World Cup earlier this year. Previously known as the DF Malan Airport, it is the second largest airport in South Africa. Kulula also operates flights from Cape Town to Durban and Cape Town to Port Elizabeth.